A GRIP ON SPORTS • There is a bit of rhythm to a college football week. It starts with a slow shuffle and moves with a quicker beat as Saturday approaches. Wednesday, that’s the day when things begin to move quickly. Hey, that’s today. Read on. • Is it Wednesday already? Yep. I can tell at my place because the trashcans and recycling bins are all on the street. And the number of college football stories I can link has more than doubled. Correlation? Probably not. But it’s that type of hard-hitting commentary you are looking for, right? Don’t have much more of that for you today. But stories, sure. Some may be destined for the trashcan. Others, they will be recycled over and over. It’s just another nonconference game for the Cougars, who follow the lead of their coach, Mike Leach, and profess to focus one week at a time. “On to Cleveland” is the attitude at work here. That’s not the same vibe that was present in Cheney yesterday, though Eagle coach Aaron Best did his best to tamp it down. At least publically. No matter. The fans can supply enough fervor for everyone. And bragging rights, which Eastern’s followers have held for two years, ever since Gage Gubrud, making his first collegiate start, threw for 474 yards, ran for another 77 and led Eastern to a 45-42 win at Martin Stadium. • A different highway leads to Safeco Field these days. The Highway to Hades. 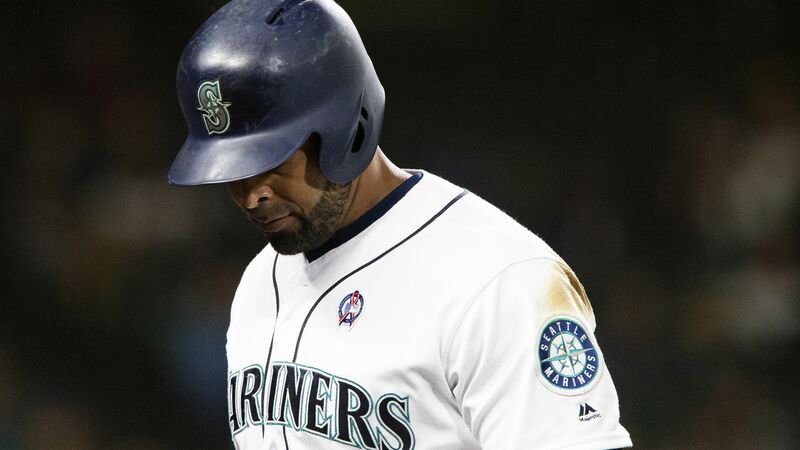 The dumpster fire that has been the last third of the Mariner season stunk up Safeco again last night, with the M’s wasting chance after chance in a 2-1 loss to the San Diego Padres. Yes, the Padres. As in the National League’s worst team. Then again, as in the 3-0-versus-the-M’s-this-year team. Seattle’s inability to compete with the National League West this year has been a key aspect of its downfall. With one game left, the M’s are 6-13 against the West. That’s not the record of a team headed to the postseason. Which is appropriate. The Mariners are not a team headed to the postseason. Last week the Hawk offensive line had to deal with Von Miller. That did not go all that well, even if Carroll felt Germain Ifedi had a pretty good game. This week Khalil Mack awaits in Chicago and that could be ugly as well. • Finally, doesn’t it seem way too early to be this cold outside? The mornings have a distinct fall chill and, as far as I can tell, it’s still officially summer for about 10 more days. I want my 75-degree days back. Now. Oh well. Winter is coming. It’s inevitable. It’s all part of the rhythm of the seasons. Or some other malarkey. WSU: Our Washington State coverage is a malarkey-free zone. Theo Lawson keeps it that way. Though I call a semi-malarkey on his Pac-12 power rankings. How can Washington be No. 1 with a loss already? It has to be Stanford. If Theo hadn’t attended Idaho, I would call him a Husky homer like his two predecessors. He must hate the Bay Area schools. (Yes, the start of this paragraph is satire or sarcasm or something.) … Theo also has a story on where new defensive coordinator Tracy Claeys likes to sit during games, which is different than his predecessor. … And there are these videos from after practice of Mike Leach, Darrien Molton, Gardner Minshew and Hunter Dale. Elsewhere in the Pac-12, it’s never too early to begin thinking of bowl destinations. And there is some disagreement about the top of the conference. … Washington’s Taylor Rapp is doing more heading into the Utah game, as if that is possible. … Speaking of Utah, the offense is once again a work in progress. It’s a story as old as time. … The offensive line is what makes every offense go, including Oregon’s. … The Beavers are still tinkering with their lineup and that’s not good. … Speaking of not good, Stanford will be without Bryce Love against UC Davis. … California is still tinkering with its quarterbacks. … Colorado will play its first game in Boulder this week. … UCLA is having to play some of Chip Kelly’s first recruits. … There was another minor injury for USC from the Stanford game. … Arizona State has more than just one receiver. … Arizona’s offensive line welcomes back a key ingredient. Gonzaga: The Zags’ schedule is complete, and for those of us who watch them all from our living room, there will be a hefty dose of ESPN. Nine of their 16 conference games will be televised by the worldwide leader’s channels, as well as five more nonconference games. Jim Meehan has all the details in this story. … Jim, Sam Adams and Larry Weir got together at the Spokane Interstate Fair yesterday and talked GU hoops for the latest Press Box pod. 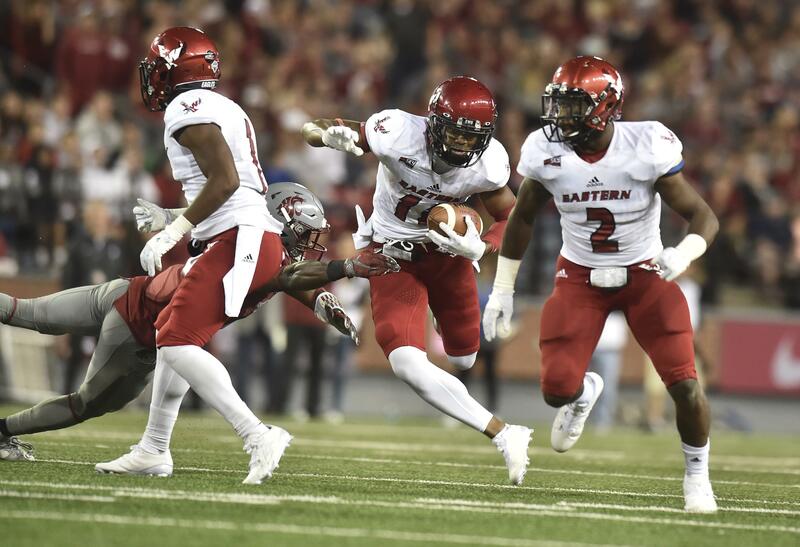 EWU: Of course there are multitudes of connections between Eastern and Washington State. That’s a given. Ryan Collingwood focuses on one such connection today with this story on defensive tackle Dylan Ledbetter. … Around the Big Sky, Southern Utah and Idaho State join UC Davis with Pac-12 opponents this week. … Montana, after a 2-0 start, heads on the road for this first time. … It looks as if Montana State coach Jeff Choate is bouncing back quickly from surgery. … A Weber State freshman earned a national honor. Whitworth: Hard work is usually repaid in full. It has been for Pirate receiver Garrett McKay. Dan Thompson explains in this story. NIC: The volleyball team opened conference play with a victory. Indians: The season is over. Spokane’s hope for a Northwest Conference title ended in Eugene, the victim of a ninth-inning rally culminated by a rare walk-off balk. It’s an odd way to end an oddly satisfying season. Chiefs: Around the WHL, Portland’s young team has a few questions to answer. … Seattle picked up a preseason win against Everett. Preps: After Tuesday’s action, we can offer roundups of slowpitch softball, soccer and volleyball. Seahawks: Pete Carroll is still optimistic, which probably doesn’t surprise you. He is even optimistic Doug Baldwin will be back quickly. Not this week, but quickly. … Chris Carson has earned the top running back spot. … There are new names to learn on defense. Mariners: It was so bad last night even Edwin Diaz couldn't save the M's. … Personally, I’m going to miss Hisashi Iwakuma. When he was at his best, as he was during the 2013 season, he was the best pitcher on the M’s staff. Heck, his career ERA is 3.42. The M’s would have assumed the entire cost of Safeco’s maintenance for another starting pitcher with that type of ERA this season. By the way, in 2013, he may have deserved the Cy Young. He finished third in the voting but had the highest pitching WAR in the American League. … There will be a new manager in Tacoma next season. Published: Sept. 12, 2018, 8:45 a.m.